Piquant, sweet and spicy mustard specialty with coarsely ground mustard seeds. Tastes great to cheese, fish, egg dishes or meatballs but is also ideal for refining sauces and salad dressings. Available in the 6.76 fl.oz jar. 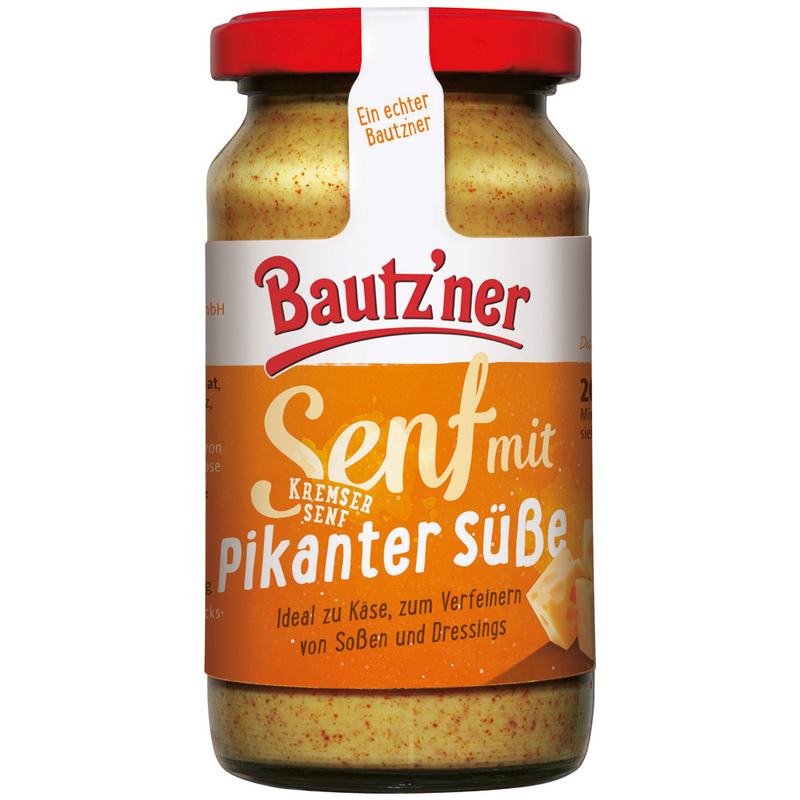 The eastern German city of Bautzen has been famous for their quality mustards since 1866. The Bautz'ner brand was founded in 1953 and is continuing this long tradition of great mustard in Bautzen to this day. The piquant-sweet-spicy Kremser mustard has it's origins in the Krems region in Austria and is the ideal companion to cheese, fish, egg dishes or meatballs. It is also perfectly suited to refine sauces and salad dressings. 200 ml / 6.76 fl.oz NET. WT. Deviations between the product information as well as their illustrations are possible. The product information on our website refers to the currently valid product on the market and the information provided is being updated regularly. However the ingredients or the recipe may be changed by the manufacturer at any time and without prior notice. During a transition period it is therefore possible, that customers receive both, the previously valid as well as the recently updated product in the same shipment. Always observe the product packaging for the most accurate description of the content which includes but is not limited to the formulation as well as the updated list of ingredients. This precautionary step can help prevent possible adverse reactions. Please note that GermanShop24 does not accept returns of grocery products (including baby food etc.) or health and personal care items. Water, MUSTARD SEEDS, destilled vinegar, sugar, salt, spices. Trinkwasser, SENFSAAT, Branntweinessig, Zucker, Salz, Gewürze.